Our Paris arrondissement map and guide to the city's 20 districts will help you find top attractions, activities, and tours in each neighborhood, and even better, help you decide which one you'd like to stay in during your visit to Paris. Paris has 20 arrondissements (administrative districts), each with its own unique personality, attractions, mouth-watering restaurants, places to shop, and interesting things to do and see. Each arrondissement even has its mayor and city hall. Although the districts have historic names, you'll usually hear Parisians refer to them by number - for example, "the 1st" or "the 6th." 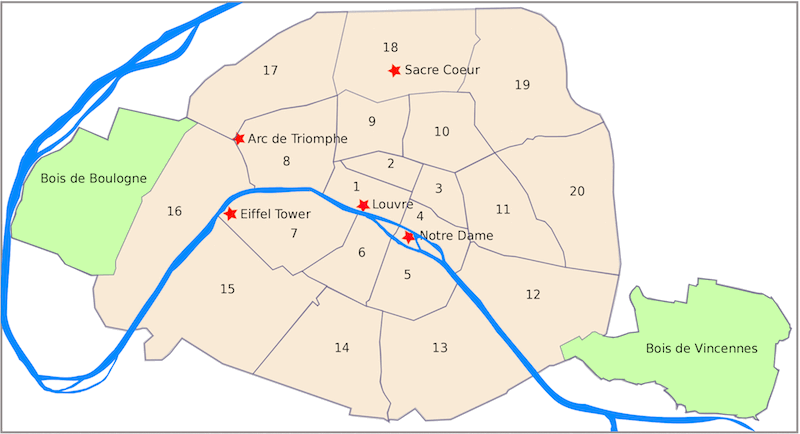 As you can see on our Paris city map showing all the arrondissements (districts), the 1st anchors the center of the city. The other 19 districts spiral clockwise around it, like an escargot shell. Arrondissement numbers offer you convenience in a couple of important ways: 1) they're included with almost all business addresses, so you can instantly determine the general location for a restaurant, hotel, or attraction, 2) most street signs include the arrondissement number, which can save you from getting totally lost in Paris. Each arrondissement contains four quartiers (administrative sub-districts) that have names. Many aren't used in everyday conversation but some - for example, Les Halles in the 1st arrondissement, Sentier in the 2nd arrondissement, Saint-Germain-des-Près in the 6th - are commonly used as neighborhood names. Other neighborhoods such the Latin Quarter and the Marais get their names from association - 800 years ago, when the Sorbonne University was founded in the 5th arrondissement, students from all over Europe used Latin as their common language, and the Marais (parts of the 3rd and 4th arrondissements) used to be a swamp, which is what marais means in French. Confused? Don't worry about it. By the time you've spent a few days in Paris, it will make more sense. Two huge tree-filled parks anchor each side of Paris - the Bois de Boulogne in the 16th arrondissement, and the Bois de Vincennes in the 12th. An almost-constantly congested multi-lane highway, the Périphérique, circles the outer districts (but not the parks). The Seine River divides the city into two sections: the Right Bank, above the river, and the Left Bank below it. Right in the middle of the Seine are two small islands, Île de la Cité and Île Saint-Louis. Île de la Cité, considered the historic heart of the city because the area's first settlers known as the Parisii made their home here, straddles the 1st and 4th districts. 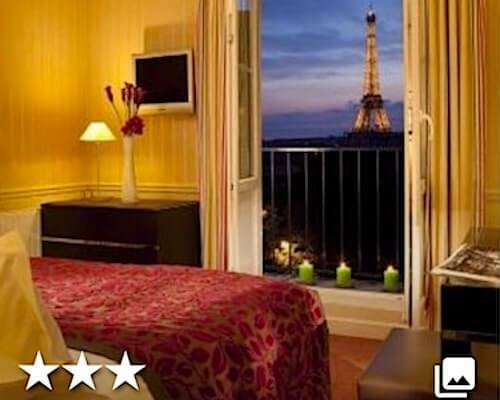 It is where you'll find many top Paris attractions. Île Saint-Louis is part of the 4th district. 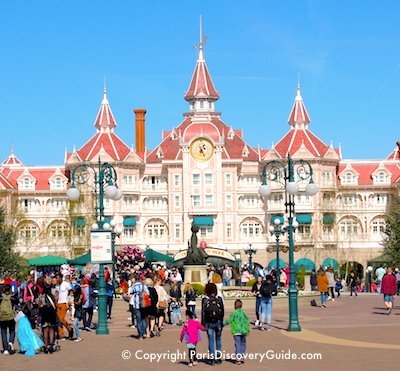 Now, let's take a look at the landmarks and attractions that make each arrondissement special to help you choose where to stay and what to see and do during your visit. Why visit: Famous attractions, spectacular gardens, and excellent cafés, restaurants, and boutiques pack the 1st with "must-see" sights for first-time as well as return Paris visitors. Discover: The Louvre, home to the Mona Lisa and many other treasured works of art. Tuileries Gardens, filled with flowers and statues, pools and fountains, cafes, and a giant ferris wheel. Musée de l'Orangerie, featuring Monet's lush waterlily paintings. Plus you can visit the hidden garden behind Palais Royal, the beautiful but blood-soaked Place de la Concorde, the soaring stained glass windows and concerts at Sainte-Chapelle, and Marie Antoinette's last abode at the Conciergerie. Newly trendy and not to be missed after a massive multi-year restoration: Les Halles, a historic market torn down years ago in the name of urban renewal, and now reborn in a glittering new format. Don't miss the jazz clubs in nearby Rue des Lombards! For shopping, the 1st offers designer boutiques, market streets, and the most popular French cookware shop in Paris. However, you'll find some interesting surprises tucked away in the 2nd - especially if you enjoy shopping and dining. Discover: Japanese restaurants lining Rue Saint-Anne. Designer boutiques around Place des Victoires, and more affordable shopping along Avenue de l'Opéra. Be sure to explore the 19th century Passages Couverts, the glass-roofed covered arcades lined with boutiques and bistros - inspiration for today's indoor shopping malls. In and around Sentier, hip restaurants started popping up a few years ago, and now chic hotels are following, making this an increasingly trendy neighborhood for visitors - plus it's next door to the even trendier Marais. Why visit: Known as the Haut ("Upper") Marais, the 3rd Arrondissement gives you a glimpse of medieval Paris plus plenty of ornate 17th century mansions and popular museums. You'll find a number of outstanding museums here including the Picasso Museum, Musée des Arts et Métiers (industrial design) with displays ranging from airplanes to perfume), and Musée Carnavalet. Discover: Jewish culture in France in the Museum of Jewish Art and History. Dine on tasty couscous or kebabs at an outdoor table next to the food stalls at Marché des Enfants Rouges, the oldest covered market in Paris where residences have shopped for 400 years. Stroll along narrow cobblestone streets and explore the indie designer boutiques. Why visit: The 4th Arrondissement is "must see" area for first time and return visitors. So many famous historic sites are here - plus the medieval Marais neighborhood offers some of the best shopping in Paris. 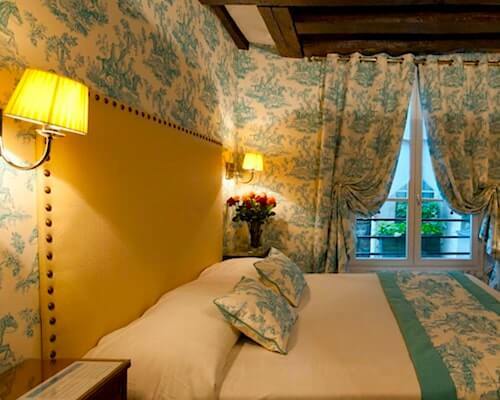 The 4th includes Île Saint-Louis, half of Île de la Cité, and a swath of the Right Bank, including part of the Marais, and is packed with top attractions, historic neighborhoods, chic shopping, and superb restaurants. Discover: The magnificent Cathedral of Notre Dame on Île de la Cité. Bertillon ice cream, considered the best in Paris, in Île Saint-Louis. Explore the trendy boutiques and galleries in the Marais, and visit antique stores and artisans in historic Village Saint-Paul. Admire modern and recent art at Centre Pompidou, go for carryout falafel in Rue de Rosiers in the Marais home of the oldest Orthodox Jewish community in Paris, and picnic in picture-perfect Place des Vosges. Why visit: Layers of history, the famous Latin Quarter and other top attractions, charming street markets, and winding cobblestone lanes make the 5th Arrondissement another "must-see" part of the city for first-time and returning visitors. Discover: The famous Pantheon, towering over much of the district. The Roman-era Arènes de Lutèce and baths under Musée Cluny, home to magnificent tapestries and other medieval treasures. The Jardin des Plants, where you'll find an ancient botanic garden, Natural History Museum, and the small but appealing Paris Zoo. Don't miss the Rue Mouffetard street market, Shakespeare and Company Bookstore, and Tunisian pastries and tiny glasses of mint tea at the Arab Institute's terrace restaurant overlooking the most scenic parts of Paris. Why visit: The lovely 6th arrondissement, called Saint-Germain-des-Prés, is a lovely upper-class mostly-residential district with commercial areas devoted to superb boutiques and dining. Discover: Beautiful Luxembourg Garden. Cafés and bistros along Boulevard Saint-Germain made famous by French Existentialists and American writers during the last century. Visit the magnificent Church of Saint-Sulpice, setting for The Da Vinci Code. Set aside plenty of time to explore the neighborhood's wonderful antique shops, home furnishing boutiques, and clothing stores. Why visit: The 7th arrondissement is where you'll find the world's most famous landmark - the Eiffel Tower - as well as several top museums, the only department store on the Left Bank, a popular market street, and many top-notch restaurants. Discover: Sweeping Paris views from the top of the Eiffel Tower. Impressionist masterpieces at Musée d'Orsay, non-western art at the Branly Museum, and magnificent sculptures and a romantic garden at Musée Rodin. Luxury goods and gourmet food and wine selections at Le Bon Marché. History buffs will want to explore the Musée de l'Armée and Napoleon's tomb. After your visit, walk a few blocks to reach the popular Rue Cler market street, overflowing with small cafes and yummy bakeries where you enjoy a wonderful lunch or dinner. Or buy a few gourmet goodies and head over to nearby Champ de Mars for a picnic. Why visit: With the Arc de Triomphe and Champs Élysées as major tourist attractions, the 8th arrondissement ranks high on the "must visit" list for most first time visitors. But there's so much to see and do here that you'll want to return whenever you're in Paris. Discover: Expansive views from the top of the Arc. and an eternal flame marking the Tomb of the Unknown Soldier at the base. Excellent art collections, exquisite architecture, and a tearoom overlooking a lovely garden at the Petit Palais. Special exhibits at the enormous glass-roofed Grand Palais. Luxury goods on display in designer showrooms along the Golden Triangle. Need a change of pace in this wealthy, tourist-filled arrondissement? Head over to tranquil Parc Monceau, and visit one of the nearby specialty museums - Musée Cernuschi, Musée Nissim de Camondo, or Musée Jacquemart-André. Why visit: For most tourists, the top reason to visit the 9th arrondissement is shopping at the Grands Magasins, or big luxury department stores - Galeries Lafayette and Au Printemps - as well as numerous other shops lining the surrounding avenues lined with outstanding examples of 19th century Haussmannian architecture. More to discover: The spectacular Opera Garnier (Paris Opera) - a must for Phantom of the Opera fans. Musée Grévin, the wax museum, located in Passage Jouffroy, one of the many historic covered arcades in the 9th. If you enjoy exploring newly hip neighborhoods, head to trendy South Pigalle, known as SoPi where you can visit the Musée de la Vie Romantic (but do know that Pigalle itself, bordering the 18th, is still rather seamy). Stop by the famous Drouot auction house, and explore the surrounding streets where you'll find many dealers specializing in stamps, antiques, and other specialized collectibles. 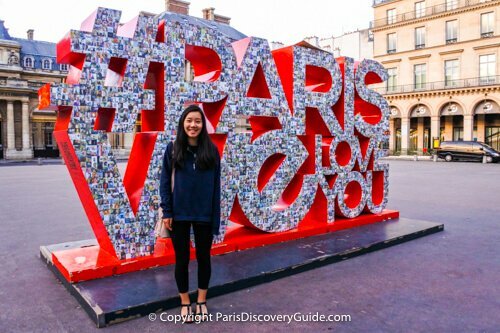 Why visit: The diverse 10th arrondissement contains two major Paris train stations, Gare du Nord and Gare de l'Ést, surrounded by numerous popular bistros and cafes, and a variety of neighborhoods - some more gentrified (meaning more hotels, etc) than others. What to Discover: Scenic bridges and locks along Canal Saint-Martin - Take a cruise, or simply stroll around the neighborhood and enjoy the colorful street art, lively cafes, and boutiques - in particular, look for up-and-coming young designers and pop-up stores. Place de la République (shared with 11th) - another trendy spot filled with bars and bistros, nightlife, and towering over the square, a magnificent statue of Marianne, Goddess of Liberty and symbol of the French Republic. Why visit: The 11th arrondissement is mostly a pleasant residential area, formerly working class but now rather trendy and increasingly gentrified, with no major landmarks aside from Place de la Bastille and the enormous Opéra Bastille where you can catch a Paris Opera concert or ballet. If you are looking for a lively nightlife scene, you'll want to check out the bars and clubs in the Oberkampf neighborhood. If you need any camera equipment or accessories while you are in Paris, you may want to visit one of the specialized camera stores along Boulevard Beaumarchais, near the Chemin Vert Metro Station. Discover: Lots of ethnic and French cafes around and near Place de la Bastille. Vintage furniture and clothing stores around Rue de Marché Popincourt and Rue Nueve Popincourt. The Bastille Arts and Crafts Market held from 9am - about 6pm every Saturday along Boulevard Richard Lenoir, starting just beyond the Bastille Métro Station. If you are adventurous, explore the almost-hidden passages and interior courtyards along the north side of Rue du Faubourg Saint-Antoine, once occupied by 19th century furniture makers and artisans, and now art galleries, craft studios, and boutiques. Why visit: Although the 12th arrondissement is primarily residential, it has several attractions worth exploring if you're on a return visit to Paris and want to interesting sites beyond the major tourist attractions. On the 12th's eastern side is the largest public park in Paris, Bois de Vincennes, complete with a chateau, English-style gardens, and a zoo. Discover: Interesting city views and exquisite gardens along the elevated parkland of the Proménade Plantée. Thrilling ballet performances at the glittering Bastille Opera. Treasures (and junk) at the Marché d'Aligre, the city's most popular flea market. Spend an afternoon browsing in the boutiques and sipping wine at an outdoor cafe in Bercy Village, converted from 19th century wine warehouses next to the Seine. Getting Around Paris ... Without Getting Lost! Getting around Paris: Most street signs display the arrondissement number - an easy way to confirm where you are. If you need to look up an address, you'll find the arrondissement number in the last 2 digits of the postal code - for example, 75004 tells you the address is in the 4th. Why visit: Fans of street art will find plenty to enjoy in the 13th arrondissement, where a supportive mayor and many concrete high-rises provide a welcoming canvas for street art professionals and amateurs. Otherwise, this is another mostly residential neighborhood - no major tourist attractions, but several interesting local spots to explore. Discover: How tapestries are made at Gobelins Manufactory, creators of museum-worthy pieces since the mid-1400s. A large enclosed shopping mall - a rarity in Paris - in Place d'Italie. Charming leafy streets in the hilly Butte aux Cailles neighborhood. And of course, look for street art - some discrete, some mammoth - wherever you go in the 13th. Why visit: The 14th arrondissement offers an interesting mix of commercial and residential areas, with plenty of cultural and historical attractions worth seeing - perhaps not on your first visit to Paris, but certainly on return visits. Discover: A maze of underground tunnels where the remains of about 6 million people are buried in the Paris Catacombs. The tombs of famous artists, writers, and performers in Montparnasse Cemetery. Contemporary art exhibits at Fondation Cartier, in a striking building designed by architect Jean Nouvel. Lots of theaters, restaurants , and several famous bistros in the area around the triangle formed by the Montparnasse-Bienvenue, Edgar Quinet, and Vavin Métro Stations. Must-see sights for the 14th: Musée Jean Moulin and Musée du Géneral Leclerc, a pair of adjacent museums devoted to the history of the French Resistence and the Liberation of Paris from the Nazis during World War II. Why visit: The 15th arrondissement is a large, mostly residential upper class district with lovely parks, a spectacular shopping mall, and easy access to Île-des-Cygnes (Island of the Swans), an almost-hidden park in the middle of the Seine. Visit the 15th to get a feel for how real Parisians live and play. Discover: Hot air balloon rides at Parc André Citroen. Spectacular views of Paris from on top of Montparnasse Tower. The weekend antiquarian and used book market at Parc Georges Brassens. A collection of top clothing and specialty stores in the upscale Beaugrenelle shopping mall. For the perfect afternoon, head to the Mirabeau Bridge and walk down the ramp to Île-des-Cygnes, a lovely sliver of an island in the Seine with excellent views of the Eiffel Tower. Why visit: Although much of the 16th arrondissement is a wealthy residential area (a favorite of well-off American ex-pats), numerous superb museums, excellent Eiffel Tower views, and the huge Bois de Boulogne park give you plenty of reasons to visit. 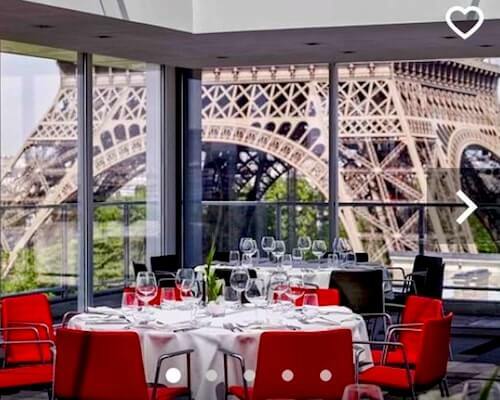 Discover: Unobstructed views of the Eiffel Tower from the marble-paved platform at Trocadéro. A large collection of Impressionist and Post-Impressionist paintings by Claude Monet at Musée Marmottan. The French Open, Fondation Louis Vuitton, a chateau and lake, a zoo, and greenhouses containing 100,000 plants in the Bois de Boulogne park. You could easily spend days exploring treasures in the 16th's many specialty museums - anthropology at Musée de l'Homme, avant-garde contemporary art at Palais de Tokyo, Asian art at Musée Guimet, fashion at Musée Galliera, and 20th century masterpieces at Musée d'Art Moderne, to name just a few. Why visit: The 17th Arrondissement's economic diversity makes it hard to categorize, and because it lacks any major tourist attractions, you might easily skip over it on your first, second, or even third trip to Paris. But if you want to explore the "real" Paris, head to the leafy Batignolles neighborhood in the eastern part of the 19th, where you'll find a mix of 19th century charm and 21st century modernization. Discover: Gourmet treats from all over France and freshly harvested organic produce in the Batignolles outdoor markets. Charming sidewalk cafes lead up to Batignolles Square, a neighborhood park filled with landscaped hills and dells, a duck pond, and pétanque courts. On the other side is Parc Clichy-Batignolles, a gorgeous new recreational area once occupied by freight yards, where you'll find a skate park, basketball courts, and a playgound surrounded by natural landscaping, scenic walks, and sustainable energy displays including wind turbines and solar panels. Why visit: Famous attractions, village-like neighborhoods once populated by artists and writers, and fantastic views of Paris attract large numbers of visitors to the 18th Arrondissement. You'll also find plenty of appealing cafes and boutiques. Discover: The sloping hills, vineyard, and storied past Montmartre. The charming village of Abbesses. Spectacular views from Sacre Coeur. Unforgettable shows and dinner at Moulin Rouge. Five floors of breath-taking textiles at the Saint-Pierre Fabric Market. And just north of the 18th, you can spend days exploring the biggest flea market in Paris (and the world), Marché aux Puces de Saint-Ouen at Clingancourt. Why visit: Cultural, recreational, and scenic attractions fill the 19th Arrondissement's two huge parks - plus the district boasts the city's largest artificial lake, the site of summer festivals, sports, and even a "beach." Discover: Cité de la Science et l’Industrie science museum, Cité de la Musique music instruments museum, and Philharmonie de Paris concert hall at Parc de la Villette. The Bassin de la Villette's beach and row boats during Paris Plage. Flower-covered slopes, a waterfall, and some of the best views of Paris in Parc des Buttes-Chaumont. Why visit: The 20th Arrondissement's main attraction is Cimetière du Père-Lachaise, where rows of ornate tombs and monuments of famous writers, musicians, artists, philosophers, and politicians perch on the landscaped hills. Discover: The final resting spots of Jim Morrison, Oscar Wilde, Frédéric Chopin, Marcel Proust, Rossini, and many other luminaries at Père-Lachaise. Street art and indie boutiques in Parc de Belleville and elsewhere in the sprawling Belleville neighborhood, which also spans parts of the 19th, 10th, and 11th arrondissements).